Dentures have been the most widely used form of tooth replacement for over a century because they are convenient, affordable, and effective. Dentures involve the use of custom-made prosthetics that allow you to regain your ability to eat and speak properly, while helping to support the facial structures. Depending on your degree of tooth loss, you have multiple options when it comes to choosing dentures. Robert C. Sikes, DDS, will evaluate your oral health and tooth loss to determine which option for dentures in Mount Pleasant TX is right for you. While dentures in the past were known for being uncomfortable and not having a natural look, now advancements make them more natural looking and functioning than ever before. For those who need full dentures, a flesh-colored acrylic arch is used that’s custom-made to fit over your gum. The arch contains prosthetic teeth that allow you to regain your ability to eat and speak. For those who are missing all of their teeth on one or both jaws, they have 2 options available: conventional full dentures and immediate full dentures. Conventional full dentures are created in a laboratory to give you a truly customized set of prosthetic teeth. To benefit from conventional dentures, you’ll have to wait until all of your remaining teeth have been extracted and fully healed. This can take several months, which is why many choose immediate full dentures. You can get immediate full dentures after your remaining teeth are removed by taking the necessary measurements and impressions at a prior appointment. While they are quick and convenient, you’ll need to have adjustments made in a few months as the bone is reshaped as it heals. 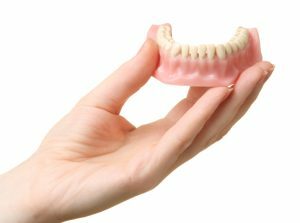 A partial denture is perfect for those who are missing one or more teeth. A partial denture consists of a metal framework that is attached to your remaining natural teeth to hold it in place. Partial dentures are the perfect alternative to bridges because they are removable. Mount Pleasant TX dentures will allow you to improve your quality of life by regaining the ability to do everyday tasks, like eating, speaking, and smiling confidently. Not to mention, when you have untreated tooth loss, your bone and supporting structures begin to deteriorate. Dentures slow the rate of deterioration by giving your bone and structures added support. While dentures offer a great solution to tooth loss, they will never feel like natural teeth, however, you will get use to them. Over a few weeks, you’ll learn how to eat and speak more comfortably and the dentures won’t feel as bulky. Dr. Sikes offers state-of-the-art dentures in Mount Pleasant TX for a complete smile. Using high-quality care, he will create custom dentures that meet your exact needs for a comfortable and reliable fit so you can smile confidently. If you’re suffering from untreated tooth loss, call Dr. Sikes at (903) 717-3063 to schedule a consultation to replace your missing teeth with dentures. Comments Off on Are Dentures Right for Me?